Florida players won three titles and finished runner-up in five divisions at the adidas Easter Bowl championships, held March 23-31, 2019, in Indian Wells, Calif. In the boys’ 18s singles final New York’s Ronald Hohmann, a qualifier who trains in Florida, defeated No. 3 seed Martin Damm of Bradenton, Fla., 4-6, 6-2, 6-4. Hohman was the first qualifier to win the boys’ 18s title in the 52-year history of the tournament. With the win the LSU recruit booked his spot in the 2019 US Open Junior Championships as a wild card, in addition to earning one entry into an ATP Challenger Tour ATP 80/ATP 90 and an ITF World Tennis Tour M25 event. Damm, as the boys’ 18s singles finalist, received a wild card entry into a ITF World Tennis Tour M25 and M15 event to be determined. The doubles title was won by the unseeded Florida team of William Grant (Orlando)/Tyler Zink (Lakewood Ranch), who in the final ousted No. 1 seeds Damm and Toby Alex Kodat (Bradenton) 7-6(3), 0-6, 11-9. Boca Raton’s Hurricane Tyra Black, the No. 1 seed in the girls’ 18s doubles with Lea Ma (Dix Hills, New York), fell in the final to No. 2 seeds Chloe Beck (Watkinsville, Ga.) and Emma Navarro (Charleston, S.C.) 6-4, 6-4. The girls’ 16s singles saw another Florida runner-up finish when No. 10-seeded D.J. Bennett (Belleview) lost to No. 9 seed Vivian Ovrootsky (San Jose, Calif.) 6-3, 6-4. Bennett earned a wild card entry into the singles main draw of a Junior ITF Grade 4 tournament to be determined. No. 12-seeded Juncheng Shang (Naples, Fla.) provided an upset win in the boys’ 14s final, topping No. 3 seed Lucas Brown (Plano, Texas) 6-3, 6-3. In the girls’ 14s doubles final top-seeded Natalie Block (Plantation, Fla.) and Lara Smejkal (Boca Raton, Fla.) were upset by No. 2 seeds Tsehay Driscoll (Pacific Palisades, Calif.) and Madison Smith (North Salt Lake, Utah) 6-2, 7-5. Abhishek Thorat (Lithia, Fla.) was another Florida highlight in the boys’ 12s final as the No. 13 seed took the title when he upset No. 2-seeded Cooper Woestendick (Olathe, Kan.) 6-4, 6-1. The Easter Bowl is the first of five junior USTA National Championship events — the USTA adidas Junior Championship Series — of 2019 and counts John McEnroe, Tracy Austin, Jennifer Capriati and Andy Roddick among its previous champions. Each year, more than 120,000 players compete in USTA junior tournaments. Players compete in levels of competition through local earned advancement in the 10s, 12s, 14s, 16s and 18s age divisions. 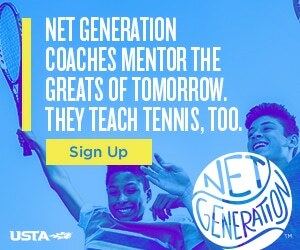 For more info or to view the full results go to www.usta.com/news.